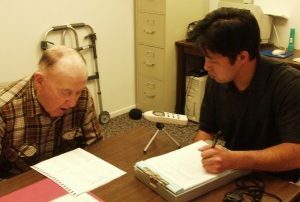 AtSouthwest Rehabilitationour services include the Lee Silverman Voice Treatment Program, Stroke Rehabilitation, Vital Stim, Lessac Madsen Resonant Voice Treatment, Swallowing Therapy, and much more. A flexible endoscope is a machine that consists of a long tube and a camera. 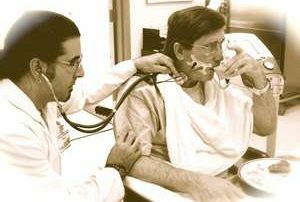 During this examination the device is passed through one of your nasal passages to the back of the throat where passage of food and drink can be observed. 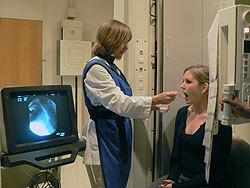 A modified barium swallow (MBS) is a special x-ray that allows the doctor, called a radiologist who specializes in using x-rays, to check problems and the Speech Language Pathologist (SLP) to identify why you have trouble swallowing. 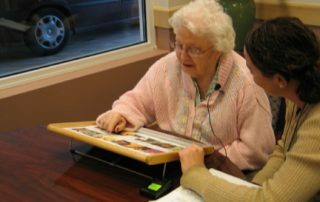 Augmentative communication is an alternative way to help people with problems speaking. Devices such as computers or hand held devices can be ordered through your insurance company. Picture communication systems can also be made for those that can not operate a commuter. After a head injury, thinking and problem solving can be affected. These skills are often referred to as executive functioning; planning, forethought, reasoning, remembering, sequencing, etc. The goals of swallowing therapy are to reduce food and or liquids from going down the air pipe, make it easier to eat and swallow, and help you get the nutrition you need to stay healthy. The LMRVT program is perfect for patients with a hoarse vocal quality. It is a step-by-step program perfect for the person whose voice feels strained and/or over-used. Vital Stimulation involves the placement of electrodes along the neck wall. A current is introduced in an effort to stimulate the muscles of the swallow mechanism. The LSVT program is an intense 1 hour a day, 4 week course that teaches people with Parkinson’s and other individuals with neurological impairments to develop the strength required to speak at normal loudness levels….